"Residing in the Northeast Kingdom seventy miles from the Canadian border in rural Vermont lives a wonderfully talented musician and composer whose proficiency on fiddle, box, and whistles is like a hidden treasure. Those who have been fortunate enough to see Eamon in performance or have one of his albums know what I mean. I have had the pleasure of accompanying Eamon in performance and on several tracks on his latest album, and I highly recommend that if you have the opportunity to hear him, do so. You won't regret it." The traditional music of Ireland is at the heart of American folk music. It's music that is full of genuine feeling; it's authentic and important. 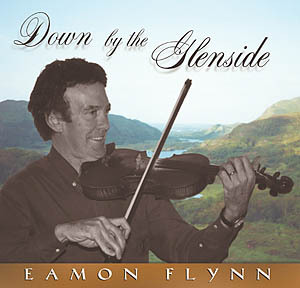 Eamon Flynn, born in Ireland's County Limerick, started playing tin whistle at age six, and by age twelve, was playing accordion and fiddle as well. Irish music is social music, and Eamon's first playing was at family gatherings where the music ranged from traditional tunes to sweet old airs to American Dixieland. Soon, Eamon was playing in Ireland and England with Irish pop-music groups, providing a taste of traditional dance tunes at concerts, dance halls, and pubs. He appeared on TV and radio in Ireland, and folk radio stations in Scotland, Germany, and Switzerland. He began tutoring music to promising young musicians and traveling throughout Ireland with the All-Ireland traditional music champions, The Brosna Ceili Band. In 1959, Eamon moved to the U.S., continued tutoring, and began composing his own traditional music. He performed with Boston-area Irish show bands, making music that ran the gamut from folk songs to rock-and-roll in the dance halls of Boston to Baltimore, and New York City to Chicago. Through it all, the music that has remained closest to Eamon's heart has been the traditional music of Ireland, the beautiful slow airs, lively reels, and stately slip-jigs that Eamon continues to play in Vermont where he now lives and writes his music. In his presentations and performances, Eamon plays and talks about the music he loves. His audiences learn about a country, a people, and a culture that have contributed greatly to America - all within the powerful, engaging music of Ireland. 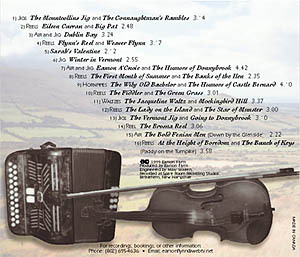 ---For booking & information: (802) 695-4636 Vermont, U.S.A.
Eamon has just released a new album which features his wonderful playing on fiddle and Irish accordion, accompanied by Helen Kiesel and Mance Grady, called Down by the Glenside -- truly wonderful collection of traditional tunes as well as Eamon's original compositions.